It’s not every day you get to attend a live event that rivals popular reality TV. Today we had a chance to check out the Seafood Throwdown at the Marblehead Farmers’ Market and enjoyed every minute of it. For those unfamiliar with this type of contest, two chefs are given limited time and a secret ingredient to battle it out for the winning title. The event is sponsored by the farmers’ market in partnership with Northwest Atlantic Marine Alliance and Cape Ann Fresh Catch in an effort to support local fishermen and educate about sustainable fishing practices. 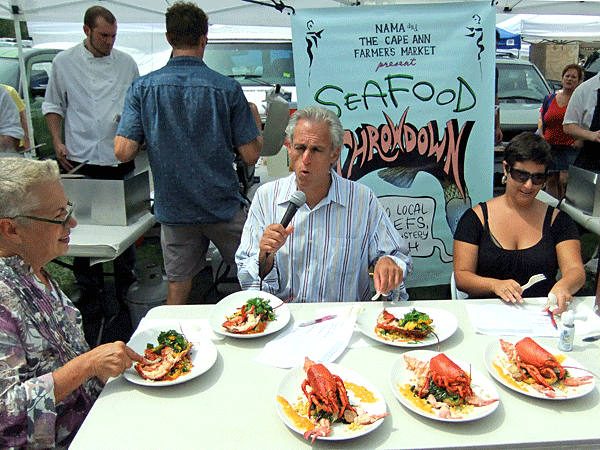 The throwdown is a relatively new idea, and although there have been several at the Cape Ann Farmers’ Market, this was the first in Marblehead. The chefs competing in the event were Paul Riccardi from Ataraxis Tavern and Barry Edelman of 5 Corners Kitchen. Sean Sullivan and Niaz Dorry from NAMA were there to oversee the proceedings, and guest judges were Rosalie Harrington, chef and former owner of the legendary Marblehead restaurant Rosalie’s; Leigh Vincola, director of marketing at Edible Boston Magazine; and Rosalie’s husband, Todd Feinberg, morning talk show host on WRKO, who also emceed. The morning got off to an exciting start when Sullivan announced that the mystery seafood would be lobster, courtesy of Marblehead’s own Paul Crowell. 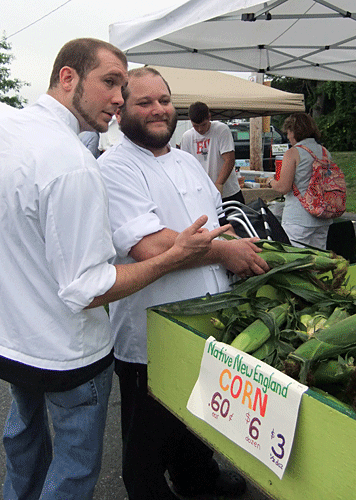 The chefs were then given $25 each and 15 minutes to shop the market for ingredients. When time was up, the horn sounded, and the chefs were allotted one hour to create a meal using the lobsters, their purchases, provided staple ingredients, and up to three unannounced items they were allowed to bring with them. As the cooking proceeded, Feinberg gave a play-by-play, cracking jokes and asking the chefs questions, even breaking into his best Gordon Ramsey impression at one point. The crowd grew, and everyone, including the kids watching, felt the excitement. It was a treat to see. Interestingly, both Riccardi and Edelman had chosen some of the same produce from the market, including small potatoes and corn. Riccardi boiled his lobsters while Edelman cut them up, boiling the claws and sautéing the bodies. The end results were gorgeous. Edelman plated a vegetable mélange first, which included the sautéed corn and potatoes as well as grilled zucchini and fresh carrot, then added the claw meat in roe butter, the lobster half, and beautiful greens that included fresh squash blossoms. Riccardi plated his “deconstructed” lobster with sautéed potatoes and corn and grilled spicy sausage on a bed of greens that had been sautéed with toasted garlic oil, which he playfully garnished with the lobster body. After tallying up the votes, 5 Corners Kitchen was announced the winner, and both participants were soundly applauded. There is no prize for winning except bragging rights, and, truly, both contenders should be proud of what they accomplished. Can you imagine creating a meal off the cuff in a hot tent in front of a crowd of milling strangers, on a deadline? Our hearty congratulations to Chef Edelman, and we hope he and Chef Riccardi continue to be involved in this sort of event. 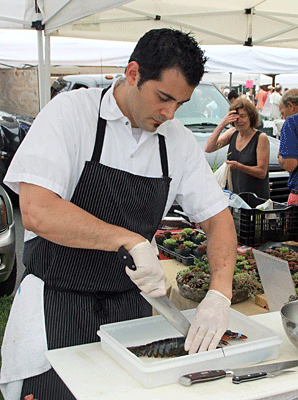 Not only does it spotlight local seafood and produce, it is also a great way to get the public more involved in their town’s food scene. And as Martha would say, that’s a good thing.